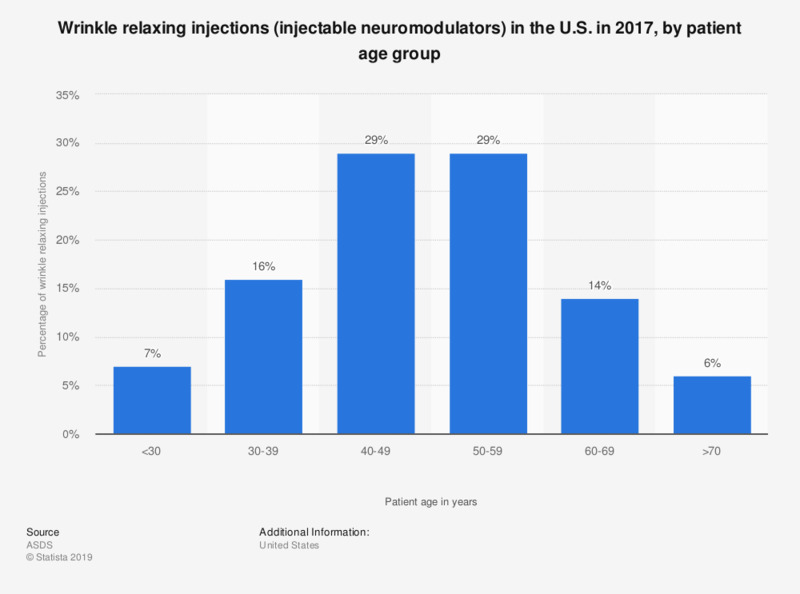 This statistic depicts the distribution of wrinkle-relaxing injection procedures or injectable neuromodulators in the United States by patient age group in 2017. Patients between 40 and 49 years of age accounted for 29 percent of wrinkle-relaxing injections in that year. These procedures are commonly referred to as Botox and is a way to minimize frown lines, forehead creases, and "crow's feet". Women are much more likely than men to have received these injections. Everything On "Anti-aging market" in One Document: Edited and Divided into Handy Chapters. Including Detailed References.